About to see a coughing dog? But it's not summer, and "kennel cough" isn't on your mind! Join us for a complimentary VETgirl online veterinary continuing education webinar, thanks to sponsorship from Zoetis, on Canine Infectious Respiratory Disease Complex (CIRD). In this 1-hour lecture, Stephan Carey, DVM, PhD, DACVIM (SAIM) will review the etiological agents, discuss the clinical presentation, and provide updates on diagnosis and prevention of CIRD. Learn what's new with Canine Influenza Virus and find out the latest updates! Lori – on the page in question there is a large, pink, register here button. NO payment needed. 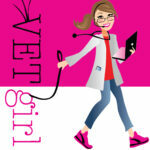 It is 100% free for the veterinary community. Can we stream this and take the quiz via the Zoetis program? The only link currently available sends you to the membership page.